It’s the Fall Review Two, at the Springfield State Fair Grounds this Saturday after last weekend’s first go-around proved to be a rousing success for Illinois horsemen and their owners. 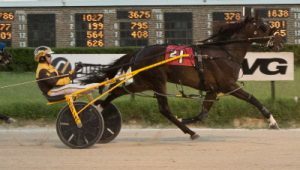 Over 100 pacers or trotters went postward and vied for $100,000 in purse money provided by the Illinois Department of Agriculture with the assistance of the Standardbred Breeders Fund Advisory Board. There’s $85,000 more on the line this Saturday, when the first of another 17 divisions of strictly ICF racing events gets under way at 11 am. Each race carries a $5,000 purse. The second Fall Review concludes harness racing in Illinois for 2017. Two of the most successful Springfield based stables for many years have been the barns of Mike Brink and Tom Simmons, long-time strong proponents of the ICF Standardbred program and supporters of the Springfield Fall Review. Between them they sent out a dozen young horses last Saturday. Purses will have the normal 50-25-12-8-5 split to the top five finishers, and again Saturday a horse finishing sixth or seventh will receive a stipend of $100. Brink will have nine 2 or 3-year-olds competing this Saturday, including last week’s Fall Review freshman pacing winners: Hart To Heart (race one) and Allbeastnobeauty (race two) and the $115,000 Night of Champions Kadabra Trot victor Illinimight (race five). With the number of harness racing dates in Illinois for 2017 at its lowest number since the late 1940s, some 67 years ago, maybe it shouldn’t have been so surprising to many of us that the horsemen’s response to the Fall Reviews was so huge. 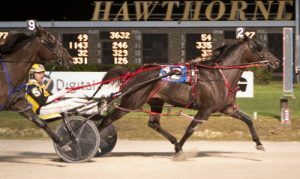 “There aren’t any more opportunities to race in Illinois this year now that the Hawthorne meet is over and every little bit helps.” said trainer Tom Simmons. Like so many other harness horsemen in our state, Simmons was pleased to see there will be more racing opportunities in Illinois in 2018. One of Simmons two winners last Saturday, was the 2-year-old pacer Backstreet Lawyer. The other was the 3-year-old Fox Valley Herbie, last year’s Illinois freshman colt pacer of the year. Backstreet Lawyer (Mike Oosting) goes postward in Saturday’s Fall Review opener. (Four Footed Fotos). Backstreet Lawyer (Mike Oosting), owned by the Illinois trio of the (Marty) Engle Stable (Buffalo Grove), Jerry Graham (Salem) and Benita Simmons (Springfield), landed into a solid the first race field of freshman pacers with Sheriff Coffey, Sports Creek, Talk About It and Hart To Heart, drawing inside of him. Springfield Qualifiers: Weather permitting qualifiers will be held this Saturday (Oct. 7), on the mile track after the Fall Review races. Entries can be made online or by phone today (Friday) from 7 a.m. until 10 a.m. by calling LeAnn Shinn at 618-783-2589.